I was going to cook a French fish dish today, “Poisson D’avril“, but the Swedish Pescetarian Society are having their annual conference in town, and to ensure they don’t run out of grub they’ve bought every single fillet of fish, fresh or frozen, in a twenty mile radius. 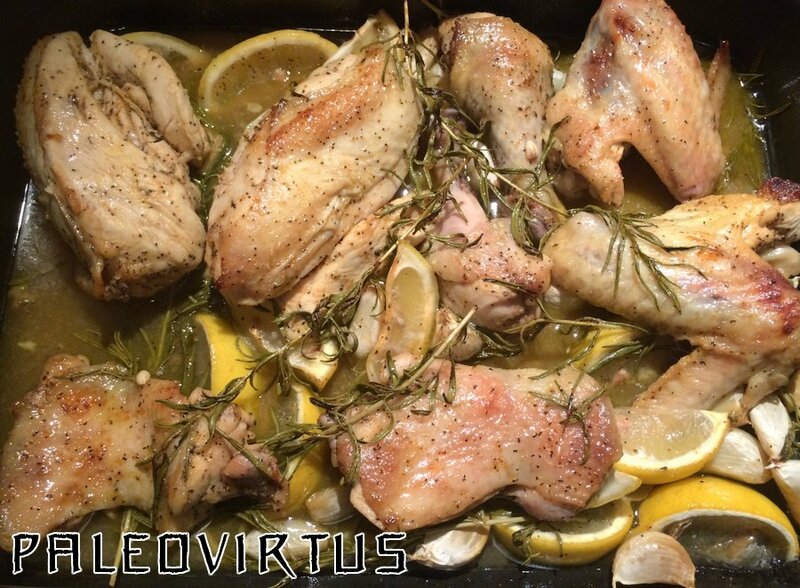 This entry was posted in Food Diary and tagged chicken, garlic, honey, lemon, paleo, rosemary on April 1, 2015 by paleovirtus. Last night the people in the apartment downstairs had a party. They weren’t overly loud as such, but the volume level was certainly high enough to remind us that they have abominable taste in music, and for us to be painfully aware that for most of the evening all the guests seemed to be arguing with one another. This dessert might have been the root cause of their grumpiness. 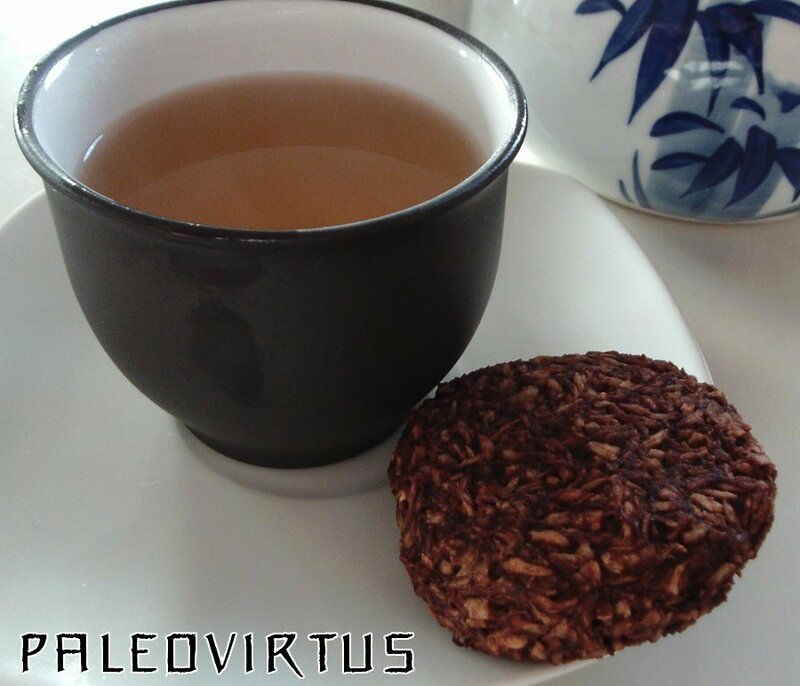 This entry was posted in Food Diary, Recipes and tagged almonds, apples, baked, cinnamon, dates, dessert, Hazelnuts, honey, paleo, raisins, recipe, vanilla on February 28, 2015 by paleovirtus. Yet another dish that could easily do the business as a poster child for Paleo. Jam-packed with taste, supernaturally good for you, and yet ready in a jiffy, its one potential drawback is the cost of the main ingredient, pushing it into a “weekend special” slot. This entry was posted in Food Diary, Recipes and tagged honey, paleo, recipe, salmon, spinach, walnuts on January 8, 2015 by paleovirtus. For latest updates to this recipe, please scroll down…. 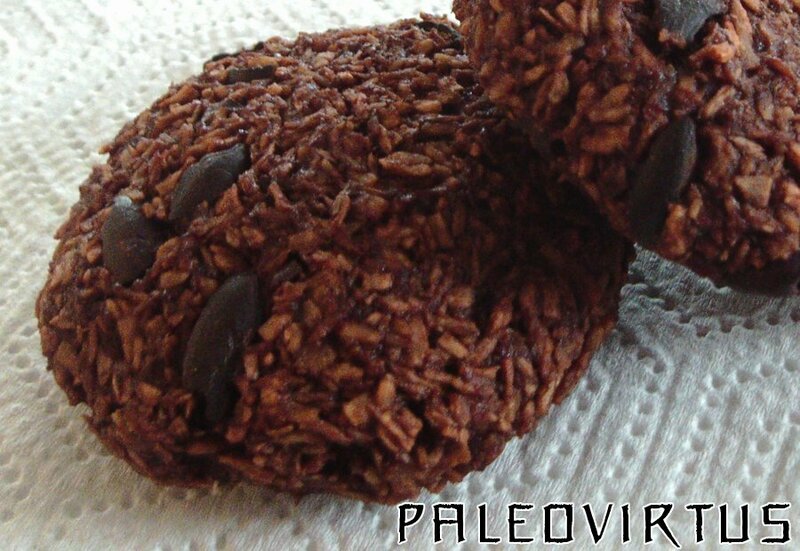 This recipe builds upon my earlier post about banana and coconut cookies, which can be found here. That post in turn was inspired by an article over at “Grok Grub”, which can be seen here. The idea behind this experiment was to bless the cookies with the gift of chocolatiness. Delicious, velvety, chocolatiness. Darkly bitter, tantalising chocolatiness. The actual preparation and baking remains otherwise unchanged – see original post for details. Me like. Me like lots. Oooh yeah, baby, me like lots! Mrs. Paleovirtus liked them so much that she declared them to be nearly as good as my blueberry muffins, which coming from her is high praise indeed. Update – 8th. October, 2014 – MORE Chocolate! I’ve experimented with the addition of 100% cocoa nibs to the base recipe in the ratio of 25g of cocoa nibs to 1 banana, etc. 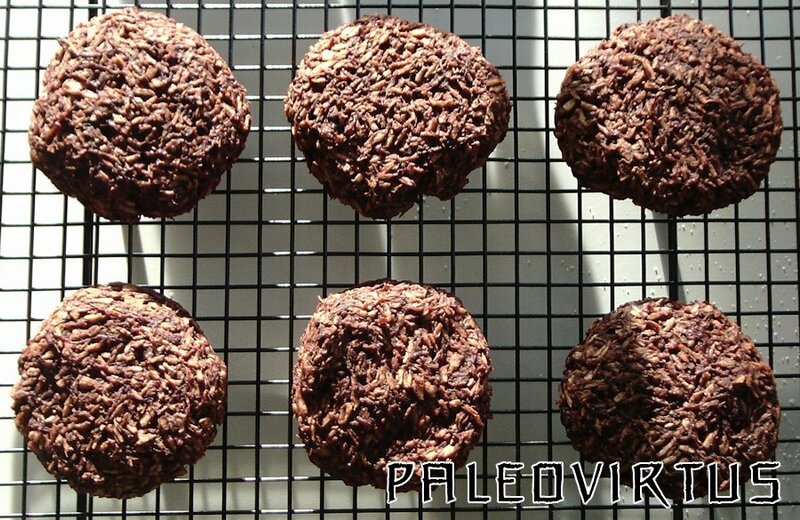 This entry was posted in Food Diary, Recipes and tagged baking, banana, chocolate, cocoa nibs, cookies, dessicated coconut, honey, paleo, recipe on October 2, 2014 by paleovirtus. We were umming an ahing on Friday evening like true champions, unable to arrive at any kind of consensus regarding what we should have to eat. Time was running out, the hunger demon was tapping on the living room window with an evil grin on his face, and even the cat was getting fed up with the situation. It looked as though a serious bout of tag-team sulking was imminent. This entry was posted in Food Diary, Recipes and tagged chicken, honey, lemon, paleo, recipe on September 29, 2014 by paleovirtus. Beef and carrots – it’s one of those timeless culinary pairings, like bacon and eggs, or tomato and basil, that just works so well on an almost molecular level that even the most sceptical of us start to believe in the notion of some kind of Grand Plan. It’s a combination that seems to cross international borders and cultural norms with ease – I even have a wonderful recipe for Chinese braised beef and carrots that is sublime, and of course we British love it so much, we wrote a song about it…. Here though this classic duo was press-ganged into use as a quick but classy supper. various cuts are called in English! 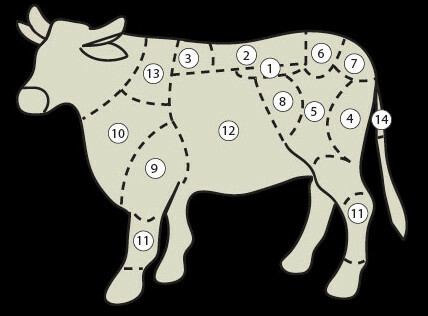 This is because I’ve done most of my meat buying in Sweden, so only really know the cuts that are commonly available here and obviously what they are called. Mrs. Paleovirtus prefers an entrecôte (No. 3 on the diagram), with it’s extra layer of fat, whereas Paleovirtus Jr. and I prefer the leaner rostbiff (No. 6). I always grill the meat on a stove-top grill pan. Take the meat out of the fridge well in advance, so that it can properly come up to room temperature before being grilled. Pat the meat dry thoroughly with kitchen paper. Keep the seasoning simple – lightly salt and pepper the meat. Heat the grill pan up to one notch below maximum – on our cooker the super-duper hob goes up to 9, and so I heat the grill pan up to 8. Just prior to grilling I lightly brush the meat with a little melted coconut oil. We like our meat grilled to medium / medium-rare, which translates as 2 x 1 ½ minutes or 4 x 45 seconds for the thinner entrecôte ( 3 minutes in total), and 4 x 1 minute for the rostbiff (4 minutes in total). 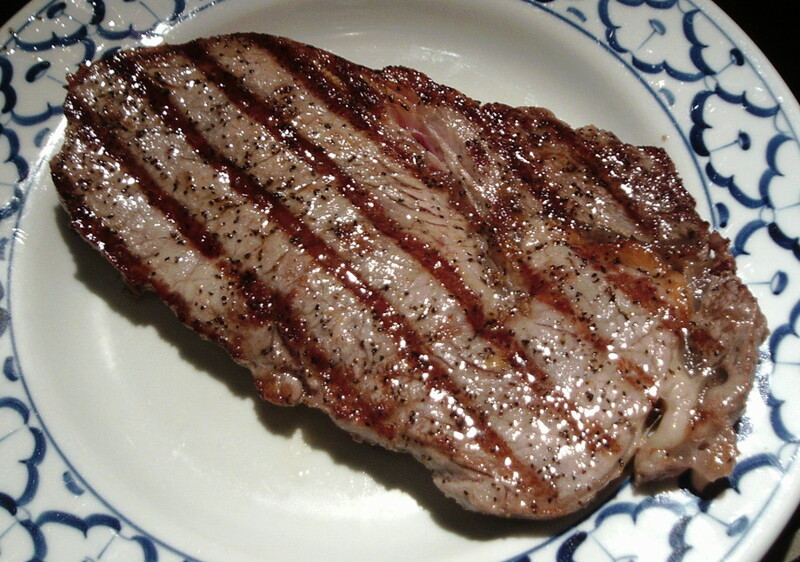 The “4 x” timings, where you grill the meat twice on each side, rotating the meat through 90 degrees for the second grilling, are for the times when you want those marty purdy cross-hatch grill marks on the meat, although even on a hot pan you might not get them at 45 seconds when grilling the entrecôte, so the 2 x 1 ½ minute timing might give a more attractive finish overall. 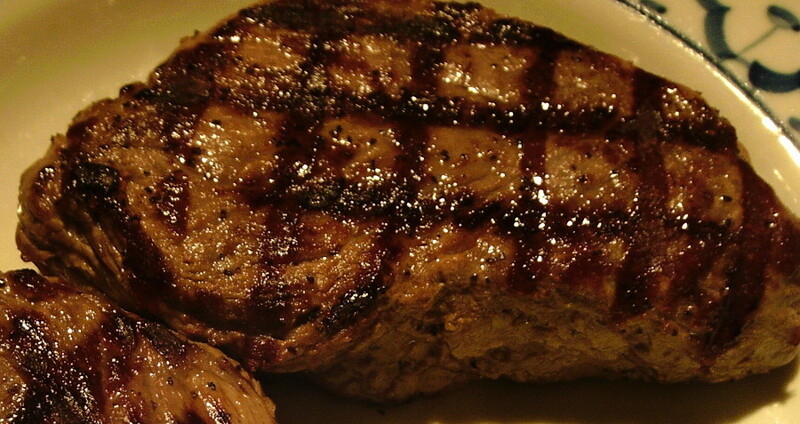 Don’t serve the meat straight from the grill – allow it to rest for a few minutes first. batons with honey and sesame seed. 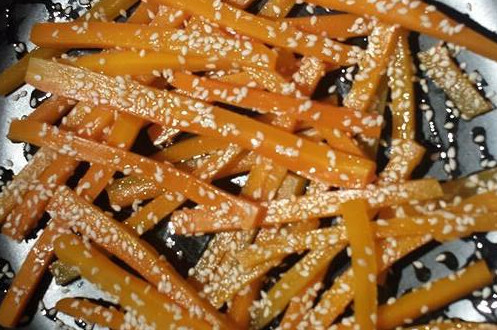 There really are no surprises here – carrot batons are steamed until just tender – 3 or 4 minutes at most, and then drizzled with honey and sprinkled with sesame seeds to taste. Add a nice bit of salad on the side and you’re good to go. This entry was posted in Food Diary and tagged Beef, grilled, honey, paleo, sesame seed, steak, steamed carrots on September 5, 2014 by paleovirtus.